AV for You set up Audio, Video, and Lighting for an event held by Affinity Plus at the J.W. Marriott in Bloomington, MN. For audio we provided 8 of our dB Technologies DVA T4 Line Array Speakers. Three T4 speakers were stacked on top of our Global Truss ST-132 Crank Stands using our DVA Speaker Stand Adapters. We also used the speaker stand adapters to attach a T4 Speaker to our JBL VRX Subwoofers on each corner of the stage. Towards the middle of the room we set up two JBL VRX Line Array Speakers on stands as Delays, providing even sound reinforcement to the ballroom. For Video we rear projected our Eiki 7KHD Projectors onto our Screen Works 9' x 16' Truss Folding Screen. 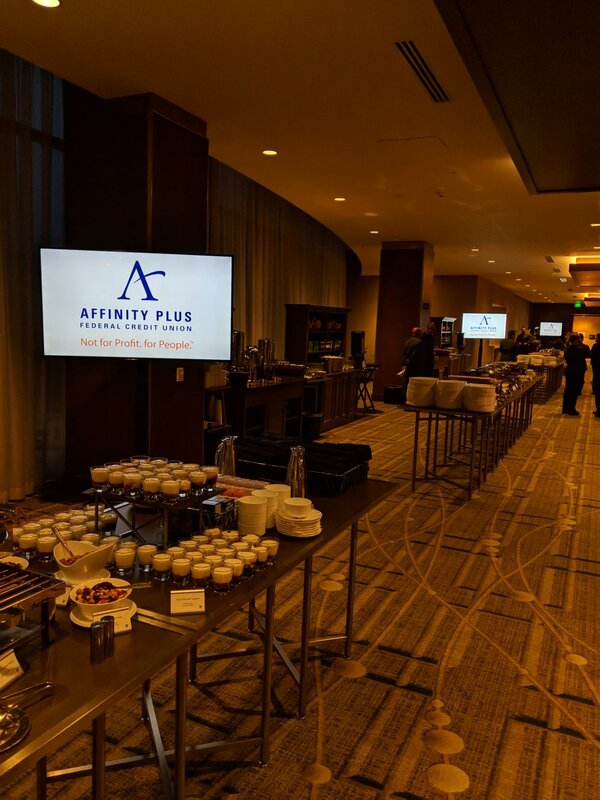 We also projected the Affinity Plus logo onto our grey drape backdrop using another Eiki 7KHD Projector on a 10' Truss tower in the back of the room. At the front of the room we provided a 60" Confidence Monitor allowing the presenter to view their powerpoint presentation and notes. 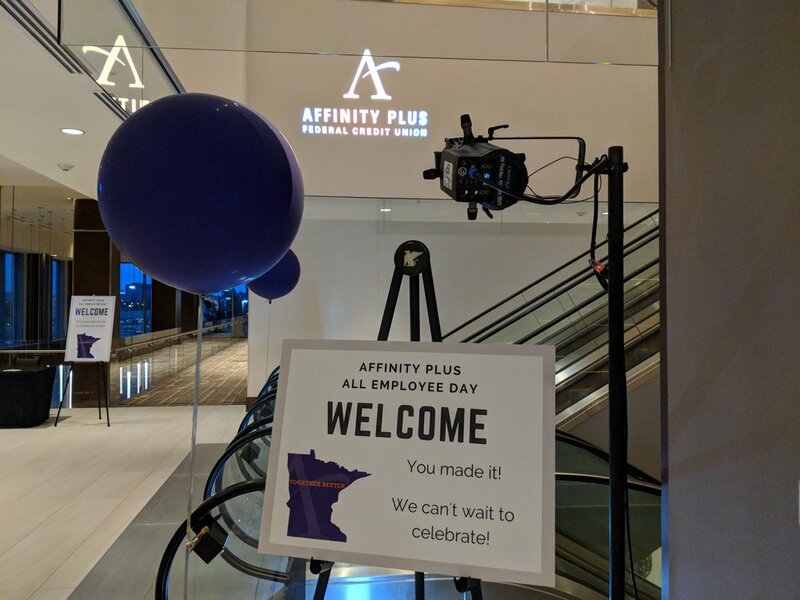 Out in the foyer we set up three 65" Monitors on stands to display the Affinity Plus Logo. For lighting we set up 8 of our Chauvet Ovation E910-FC Lights on 15' Truss Towers on each side of the room for a stage wash. We set up two ETC Source 4 Par lights for backlighting onstage adding extra definition for the IMAG (Image Magnification using our Panasonic HD Camera) on the screens in the room. We also set up 10 of our Eternal Lighting ECHOCube Battery Powered Uplights on the grey drape backdrop set to Purple. Other additions were custom gobos and hologram projector. We projected one in the ballroom using a Chauvet Ovation E910-FC Light on a 8' schedule 40 pipe against the side wall. We also used the same set up to project a gobo in the escalator stairwell. We set up our Kino-mo Hologram Projector in the registration area to display moving floating logos of sponsors at the event. At the tech table we set up our Behringer X32 Mixer and two Shure QLXD4 Wireless Microphone Racks for clean and reliable audio during the event. We set up our Analog Way Saphyr Video Switcher, a Playback Pro laptop and Powerpoint laptops to provide seamless switching between presentations and video rolls. We also have the Perfect Cue remote for advancing powerpoint slides and the ETC Smartfade Lighting Console for controlling the brightness of the stage wash.